Grim news over Cuba’s economy was delivered in July 8 speeches to the country’s legislature (the National Assembly of People’s Power) by Cuba’s President, Raúl Castro, and by Cuba’s Minister of Economy and Planning, Marino Murillo. Naturally the Cuban people are worried. Here is a summary of those developments. “As clear evidence of our strength and experience, we have had favorable results in implementing the plan of prevention and confrontation of mosquito-borne diseases. 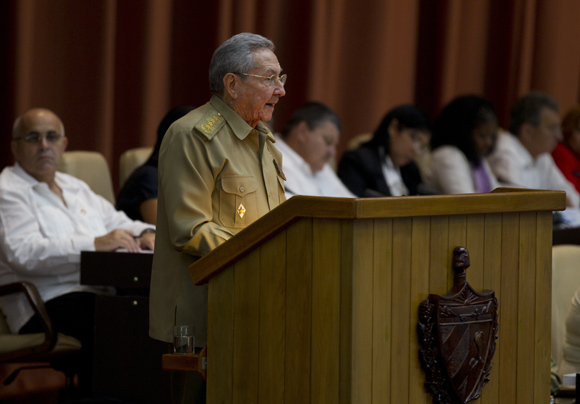 In his July 8 speech to the Cuban legislature, Marino Murillo, a member of the Politburo, Vice President of the Council of Ministers and Minister of Economy and Planning, essentially repeated the main points of President Castro’s report. The 1% increase in Cuban GDP for the first half of 2016 stands in contrast to the 4.7% increase for the first half of 2015. According to Reuters, Venezuelan shipments of crude oil and refined products to the island nation decreased around 20% for this period. As a result of these economic problems and challenges, Cuba is concentrating on reducing expenses, promoting conservation and efficient use of available resources; concentrating investments on activities that generate exports and replace imports; strengthening infrastructure; assuring the sustainability of electrical generation; and facilitating better use of energy resources. The plan is to reduce total electricity consumption by 6% while not cutting residential use and key revenue-generating sectors such as tourism and nickel production. More than 450,000 U.S. citizens or residents were among the 3.5 million tourists to visit the island last year, when the total number of visitors rose 17% from 2014, and the number of U.S. visitors for the first half of 2016 was up 26% to 304,000 out of a total of 2.1 million visitors to the island. Those numbers are likely to rise further when commercial flights from the U.S. begin later this year. Cuba’s future exemption from electricity restrictions for privately-owned businesses that cater to tourists could be seen as a Faustian bargain. Cuba desperately needs the hard currencies that tourists bring and spend on the island. On the other hand, the increasing numbers of U.S. visitors are tending to spend their money on Cuban bed-and-breakfasts, taxis, meals in privately-owned restaurants and other services that will increase demands for electricity and nurture Cuba’s nascent urban middle class and increase pressures for political and economic change. Signs of these changes already can be seen. Public offices and state-run companies have cut work hours and are limiting the use of air-conditioning. Cinemas have cut the number of film screenings, and petrol stations are running out of fuel more frequently than in the past few years. Castro, Faced with the difficulty, there is no room for improvisation or defeatism, Cuba Debate (July 8, 2016)(English translation of text of Castro speech), http://www.cubadebate.cu/opinion/2016/07/08/raul-castro-la-velocidad-de-los-cambios-seguira-estando-condicionad a-por-nuestra-capacidad-de-hacer-las-cosas-bien/#.V4Tyf5MrLj0;There is no room for improvisation or defeatism, Granma (July 8, 2016)(report about Castro’s speech), http://www.granma.cu/cuba/2016-07-08/el-pueblo-revolucionariocubano-nuevamente-se-crecera; Reuters, Castro Admits Cubans Face Hard Times as Economy Slows Sharply, N.Y. Times (July 9, 2016), http://www.nytimes.com/reuters/2016/07/09/world/americas/09reuters-cuba-economy.html?_r=0; Assoc. Press, Raul Castro Says Venezuela’s Crisis Hurting Island Economy, N.Y. Times (July 9, 2016), http://www.nytimes.com/aponline/2016/07/08/world/americas/ap-cb-cuba-parliament.html. Murillo, Cause the least possible services to the population, Granma (July 9, 2016); Marino Murillo: Come adjustments in the economy, without affecting basic services to the population (+ Video), Cubadebate (July 8, 2016) (the English translation of his speech in the Cuban press is impossible for this blogger to follow and understand); Reuters, Cuban Economy Minister Details Dire Economic Measures, N.Y. Times (July 9, 2016), http://www.nytimes.com/reuters/2016/07/09/world/americas/09reuters-cuba-economy-austerity.html. Burnett, Amid Grim Economic Forecasts, Cubans Fear a Return to Darker Times, N.Y. Times (July 12, 2016), http://www.nytimes.com/2016/07/13/world/americas/cuba-economy-venezuela-power-cuts.html?ref=world; Althaus, Growing Flow of Americans Remakes Cuba, W.S.J. (July 12, 2016), http://www.wsj.com/articles/growing-flow-of-americans-remakes-cuba-1468365712. On July 13, the State Council of Cuba announced that Marino Murillo was being replaced as Minister of Economy and Planning by Ricardo Cabrisas Ruiz, Vice President of Council of Ministers. According to the State Council, Murillo, in his capacity as Deputy Prime Minister and Head of the Permanent Commission for Implementation and Development, will now focus on updating the Cuban economic and social model, adopted by the 6th and the 7th Party congresses. Of the US visitors in 2015, 310,000 were Cuban Americans going to visit family, the remaining 130,000 were American licensed travelers. Yes the soft glove policy of the present US administration to undermine the democratically elected governments of Latin America and reinsert US control is having a detrimental effect on Cuba in order to push those benefiting from US tourism toward speaking out against the current Cuban government. The “normalization process” intent from the beginning was just a change in tactics and not the policy of overthrowing the Socialist government of Cuba. I wonder if the author of this blog is aware of that and will admit that the American people are as much to blame for not holding the US administration to it’s promise of ending the embargo. Are we a democracy? The stalling on It’s ability to end financial penalties on US and international banks for doing business with Cuba is especially troubling.